Just yesterday, my wife pointed me to a link on ‘Facebook’, which looked kind of fishy. Her friend had shared a linked which was public to all her friends and made vulnerable to attack, whomever clicked or liked it. Millions of users have already been infected by this nasty Facebook Worm. 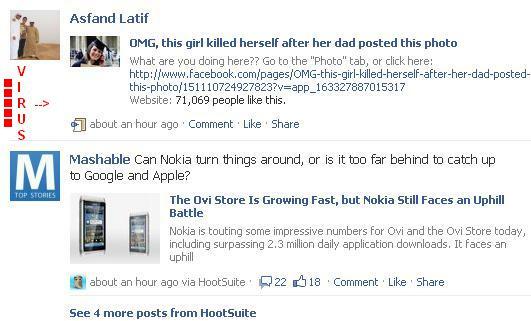 Facebook users are forced to ‘LIKE’ a Facebook page which hence spreads through their wall post. For now, we have only been able to point towards the Worm but still investigating as to what it does. Passwords and Account have been deemed safe from this worm but something is pretty wrong about it. The Facebook Team have been informed and as soon as we hear from them, we would update all our readers. Stay updated and be Safe.